One of the easiest and quickest ways to meal prep on the weekend is to make 2-3 components that can be used in several meals throughout the week. 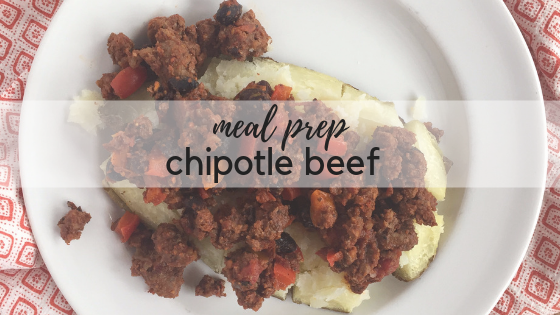 Example: Meal Prep Chipotle Beef. I made this last week and used it for breakfast, lunch and dinner over the course of several days. Forget about Cook Once, Eat Twice….this qualifies for Cook Once, Eat A Lot! Lightly spray large skillet with cooking spray and warm over medium-high heat. Add ground beef and cook, breaking up into smaller pieces. Cook until beef is cooked through and no longer pink. 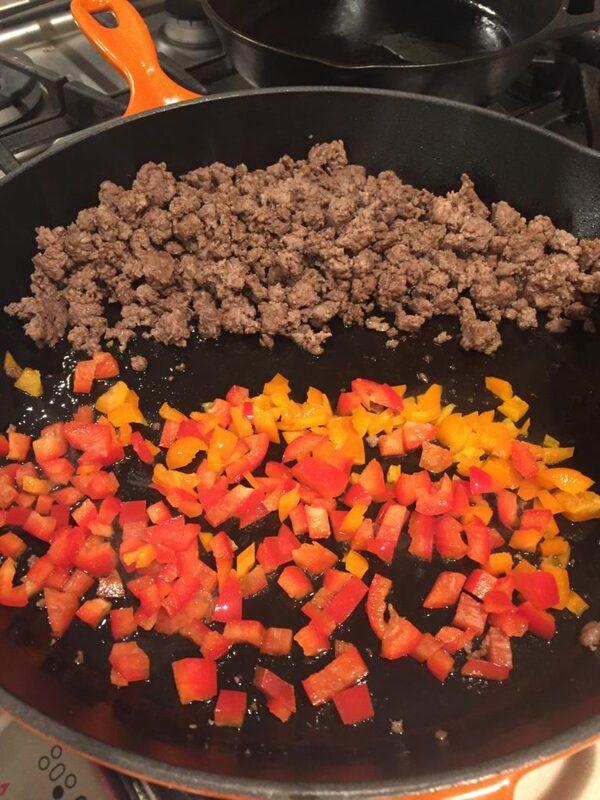 Move beef over to side of the skillet, add a little more cooking spray to empty half of skillet, then add the peppers (see picture below). Sauté the peppers until softened, then mix in with ground beef. Reduce heat to medium, add black beans, tomatoes (with juice), and taco seasoning and mix well. 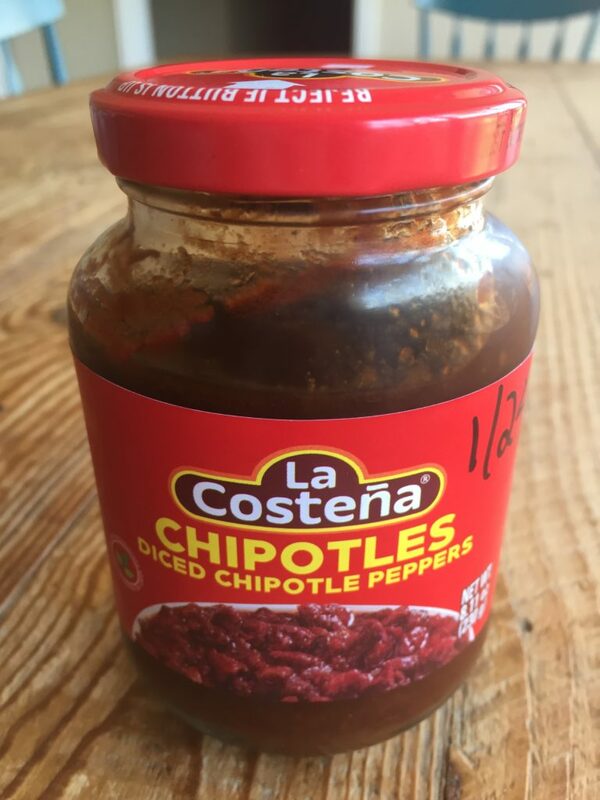 Add chipotles, starting with 1 tablespoon, adding more to taste. Serve immediately or see make ahead notes below. Cook as directed, let cool completely then store in an airtight container in the refrigerator several days. Reheat in microwave, or in lightly oiled skillet over medium heat. This is great over roasted potatoes (russet or sweet), in a burrito bowl with rice, cauliflower rice, grated cheese, and tortilla chips, wrapped up in a tortilla, with eggs in breakfast tacos, or on top of a mixed-greens salad. #2-Canned chipotle peppers in adobo sauce work great in this recipe….I always try to buy the pre-diced peppers in a jar like these, but if you can only find the canned, simply dice the whole can and store them in a jar in the fridge. They’ll keep several weeks if tightly sealed and refrigerated.